Gordon G Hammes, PhD, is the Duke University Distinguished Service Professor of Biochemistry Emeritus. From 1991-1998, Dr Hammes was the Vice Chancellor for Academic Affairs at Duke University’s Medical Center. He came to Duke from the University of California, Santa Barbara, where he was also the Vice Chancellor for Academic Affairs. Dr. Hammes grew up in Fond du Lac, Wisconsin. where he frequently performed as a concert pianist before attending Princeton University. Dr.Hammes earned a PhD from the University of Wisconsin, Madison. Upon graduation, he was an NSF Postdoctoral Fellow at the Max Planck Institut in Göttingen, Germany with Nobel Prize winner Manfred Eigen. In 1960 he joined the faculty at MIT and then moved to Cornell University in 1965 where he was chair of the Department of Chemistry (1970-75) and Director of the Center for Biotechnology (1983-88). He is a member of the National Academy of Sciences and the American Academy of Arts and Sciences, and has received several national awards, including the American Chemical Society Award in Biological Chemistry (1967) and the American Society for Biochemistry and Molecular Biology William C. Rose Award (2002). The American Chemical Society established an annual lectureship bearing his name in 2008. 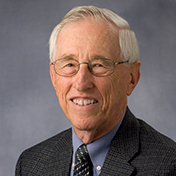 Dr Hammes has authored more than 250 scientific publications, including six books. His major research interests are in biophysical chemistry, especially enzyme kinetics and mechanism, metabolic regulation, multienzyme complexes, membrane-bound enzymes, and single-molecule fluorescence microscopy. He maintains his strong interest in music, especially piano performance, and in 2010 captained the gold medal winning USA International Tennis Team in his age group. He has been married for more than 50 years to Judy Frank and has three married children and six grandchildren.